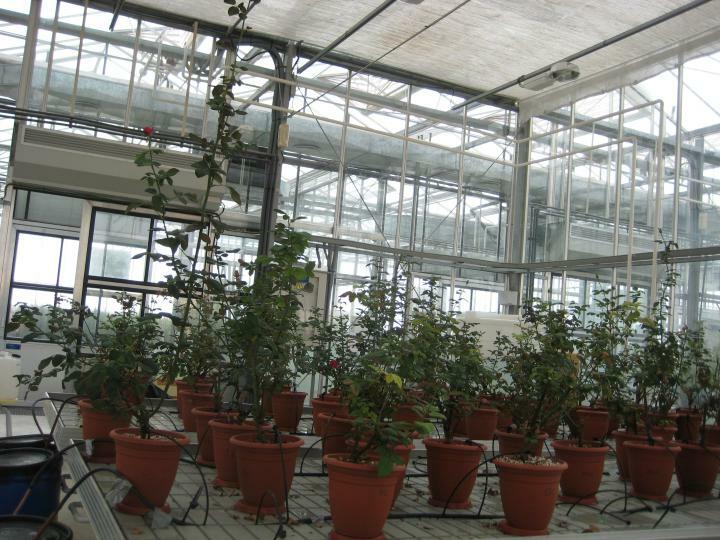 Place: Greenhouse 2, in the Technical Services of Investigation (SIGUA), University Campus of San Vicente del Raspeig. 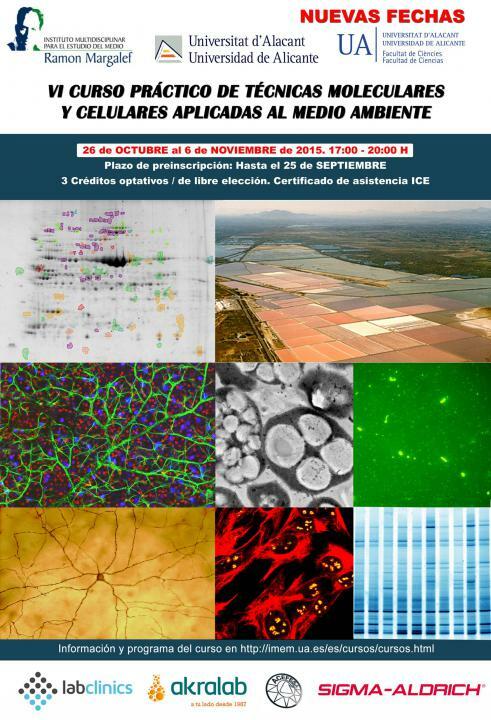 VI COURSE PRACTICAL MOLECULAR AND CELLULAR TECHNIQUES APPLIED TO ENVIRONMENT NEW DATES! Target audience: Students of PhD, Master and past courses of undergraduate degrees in biology, environmental sciences, marine sciences and related disciplines. University of Alicante. Place: (a) research laboratories and lecturers of the Faculty of Sciences. (b) technical research services). (c) computer rooms. d) meeting room of MIES. University campus of San Vicente de el Raspeig. a) Research laboratories and teachers of the Faculty of science. b) Research Technical Services. c) Computer room. d) The IMEM meeting room. University campus of San Vicente. Location: a) Research Laboratories and teachers of the Faculty of Sciences. b) computer rooms. c) Meetings of the Board of IMEM. Campus Universitario de San Vicente. Open First Pre-registration: Until 10 September. 4th Edition of the Lecture series: "CONSERVATION AND ENVIRONMENTAL IMPACT OF LAND AND THE LANDSCAPE: THE MEDITERRANEAN"
Registration fee: 20 euros for applying the two elective credits and recognition of hours ICE. 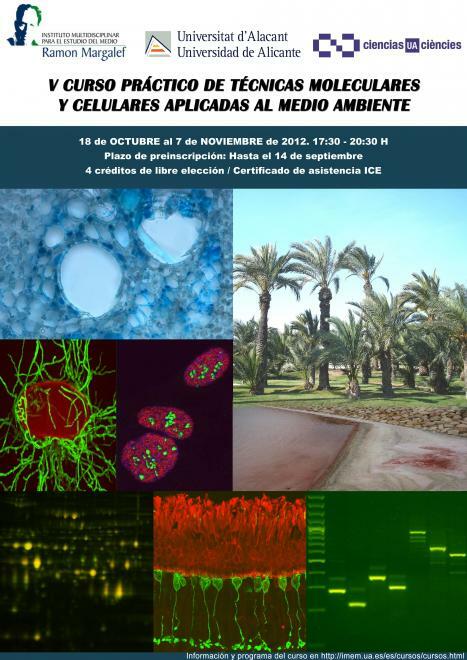 The conferences began in October 2010 at Sede of Alicante from 19:00 a 21:00 h.
Dr. José Enrique Tent, IMEM Ramon Margalef/Dpto. 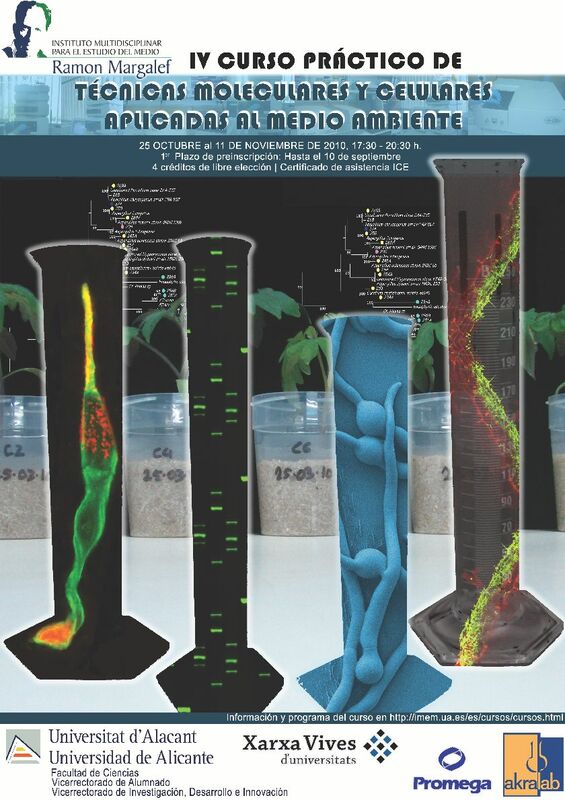 Sciences of the Earth and of the Environment, University of Alicante. Dr. Lahcen Taiquí, University of Tetuan, Morocco. Place: computer room of the Faculty of Sciences, laboratory of the Department of ecology, Earth Sciences Laboratory and the environment and output to the field. ( Place: to) research laboratories and teachers of the Faculty of science. (b) computer room. (c) the IMEM meeting room. University campus of San Vicente. Calendar:Session from 17: 30 to 20: 30 h, days: 4-5, 9-12 i 15-18 Dec. Total: 10 sessions of 3 h.
"THE OASES IRRIGATED HISTORIC LANDSCAPES"
Course: "Iintended environmental and conservation of the territory and the"